Iaido - 'The Way Of Mental Presence And Immediate Reaction' was founded in the early 16th Century by Hayashizaki Jinsuke Shigenobu More than a century before Iaido came into being a similar art Iaijutsu had been developed by Iizasa Lenao the legendary founder of the famed Tenshin Shoden Katori. Both of these arts involve perfecting control of the sword.In its original form this meant drawing it from its scabbard, then striking, cutting, removing the blood, and replacing the sword - all in one smooth, fluid motion. It is likely the art was developed to save crucial seconds in the event of a surprise attack. A warrior trained in Iaido would have lightning-sharp reactions and could respond instantly.Today practitioners use either blunt or sharpened metal swords, and are trained to achieve an enhanced state of awareness and sensitivity to the wider environment. although the art is non competitive there is however competitions that do take place in front of a panel judges. Iaido teaches the use of actual metal weaponry, it is almost entirely based on the teaching of forms, or kata. Multiple person kata do exist within some forms of iaido, but the iaidōka (practitioners of Iaido) will usually use bokken for such kata practice. 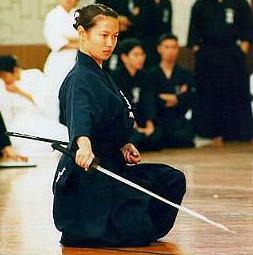 Iaido is often used interchangeably with Battōjutsu(抜刀術), literally meaning "technique of drawing the sword". Battōjutsu is the historical (ca. 15th century) term encompassing both the practice of drawing the sword and cutting (tameshigiri). The term Iaijutsu (居合術) became prevalent later (ca. 17th century), and the current term Iaido is due to the general trend (stemming from gendai budō) to replace the suffix -jutsu with -do in Japanese martial arts in order to emphasize a philosophical or spiritual component. In contemporary usage, battōjutsu focuses on the techniques of cutting, with individual practice that starts with the sword in the sheath. Battōjutsu emphasis is on cutting with the sword. All terms are somewhat more specific than kenjutsu or kendō which more broadly means simply sword techniques, and is often used to refer to techniques where the sword is already out of the saya. Iaido forms (kata) are performed solitarily against one or more imaginary opponents. Some traditional iaido schools, however, include kata performed in pairs. Some styles and schools also do not practice tameshigiri, cutting techniques. The primary emphasis in iaido is on the psychological state of being present (居). The secondary emphasis is on drawing the sword and responding to the sudden attack as quickly as possible (合). Starting positions can be from combative postures or from everyday sitting or standing positions. The ability to react quickly from different starting positions was considered essential for a samurai (侍). The Tenshin Shōden Katori Shintō-ryū (天真正伝香取神道流) included iaijutsu in its curriculum in the 15th century. The first schools dedicated exclusively to sword drawing appeared some time during the late 16th or early 17th century. Hayashizaki Jinsuke Minamoto no Shigenobu (林崎甚助重信) (1546–1621) is generally credited with as being the originator of the first dedicated school of sword drawing. Little is known of his life, leading some scholars to doubt his historical existence as a real person. The two largest schools of sword drawing that are practised today are the Musō Shinden-ryū (夢想神伝流) and Musō Jikiden Eishin-ryū (無雙直傳英信流). Both schools trace their lineage to Hayashizaki Jinsuke Shigenobu. Before Nakayama Hakudo (1873?-1958) coined the word iaido early in the 20th century, various other names such as battō, battōjutsu, or saya no uchi were used. Iaido is the usual term to refer to the modern self-improvement oriented-form taught by the All Japan Kendo Federation (AJKF), while Iaijutsu is used for some amongst the older koryū combative techniques. In the Japanese series and films of Zatoichi, the protagonist mainly uses Iaidō techniques when fighting with his shikomi-zue. The character Ukyo Tachibana in Samurai Shodown fights with his sword sheathed, drawing it in a style similar to battōjutsu. 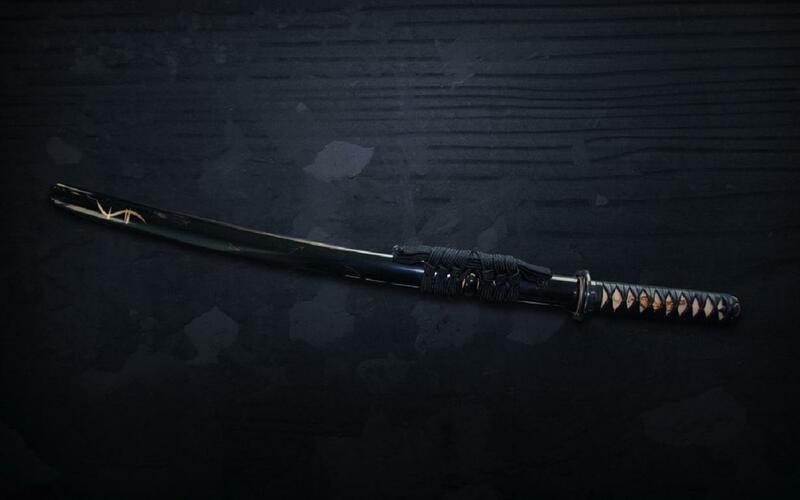 The character Setsuka in Soulcalibur III uses a Shikomi-zue style katana concealed in the shaft of an umbrella, in a manner similar to battōjutsu. Also, the character Mitsurugi has several stance techniques resembling battōjutsu. In Samurai Warriors 2, some of Akechi Mitsuhide's attacks came out from his scabbard. One happens as a charge attack, one occurs during his normal attack, and two come from his special stance: a super-fast forward cut that leaves a shadow for a brief moment, and a counter. In Dynasty Warriors 4 and 5 Extreme Legends, Zhou Tai uses it in his normal, charge and musou attacks. In Bushido Blade 2, Gengoro, when equipped with the katana, has a series of attacks and stances from battōjutsu. Future Hiro Nakamura in Heroes reveals that he trained in Tōhoku in battōjutsu. In Rurouni Kenshin, the hero Himura Kenshin is a practitioner of Hiten Mitsurugi-Ryū (飛天御剣流? lit. 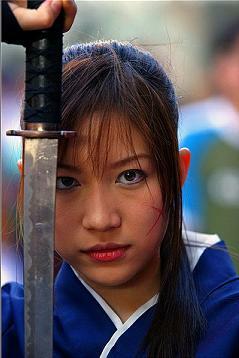 "Flying Heaven Honorable Sword Style"), which utilizes superhumanly-fast Battōjutsu-oriented techniques. In the video game series Fire Emblem, the Sword Master class uses a form of Battōjutsu as his or her attack. In Devil May Cry 3: Dante's Awakening, Vergil's attacks with Yamato resemble Battōjutsu as well as Iaidō. In 9 Dragons, members of the Wu Tang Blue Dragon class can acquire a Battōjutsu special attack at higher levels. In the anime and video game series Sakura Taisen, Sakura Shinguji wields the same method of fighting with her Arataka. In the Guilty Gear video game series, Johnny and Baiken uses stances and attacks from battōjutsu. In No More Heroes, the protagonist Travis Touchdown performs movements resembling Battōjutsu during the pre-battle animation while equiped with the Tsubaki MkIII. He does not, however, actually strike an opponant in such a manner. In Bleach the anime exclusive character Patros uses a style reminiscent of iaidō. In Lupin the Third Goemon Ishikawa XIII wields his zantetsuken(katana sword) in a style resembling Iaido and battojutsu. In one of Lupin's movies Goemon Ishikawa XIII even gives credit to Hayashizaki Jinsuke Minamoto no Shigenobu (林崎甚助重信) for creating this style.